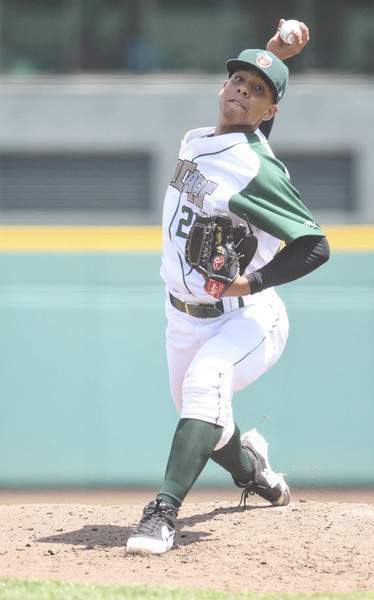 Michelle Davies | The Journal Gazette TinCaps starting pitcher Luis Patiño has worked his way up the Padres’ prospect list. 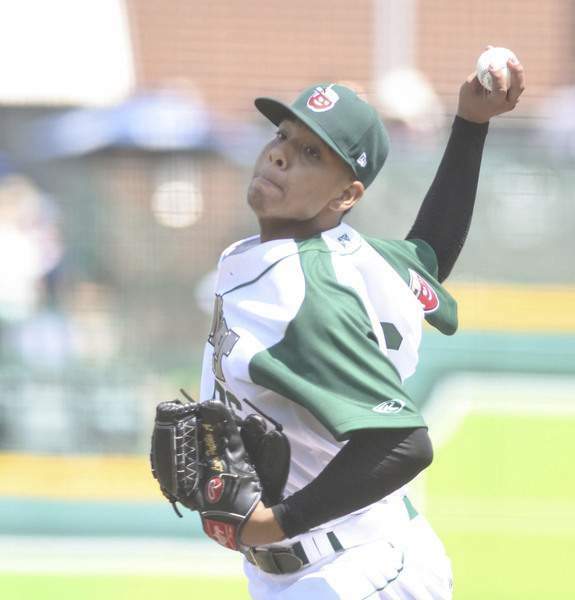 Michelle Davies | The Journal Gazette TinCaps' Luis Patino started off pitching against West Michigan Wednesday at Parkview Field. The San Diego Padres boast easily the top farm system in baseball. The seeds for that loaded system were planted in the international signing period of 2016-17, when the team spent a whopping $78 million to sign 47 players. San Diego signed six of the top 30 international prospects in that cycle, five of whom are now TinCaps: Luis Almanzar, Jeisson Rosario, Justin Lopez, Tirso Ornelas and Gabriel Arias. All five signed for at least $1 million. In addition, the Padres landed relatively unheralded right-hander Luis Patiño for a paltry $120,000. Two years later, as well as Rosario and Ornelas have played, there is an argument that Patiño is more advanced than any of his fellow signees from the 2016 class. The 18-year-old has used a blazing fastball and devastating slider to become one of the best pitchers in the Midwest League since arriving in Fort Wayne in mid-May. Patiño got off to a rocky start, posting an 8.64 ERA in his first two starts with the TinCaps. Since then, he's been dominant, compiling a 1.36 ERA and striking out 62 hitters in 53 innings while walking just 14. His performance is particularly impressive considering he is the third-youngest pitcher in the league and almost three years younger than the average hitter he's facing. Despite his overpowering performance, the Barranquilla, Colombia, native remains unsatisfied and said he wants to improve his command as the season continues. That mantra has helped him rocket his way up top prospect lists this season. He wasn't among the Padres' top 30 prospects when the season began, according to MLB.com, but had risen to No. 12 by midseason, higher than every TinCap except starting pitcher MacKenzie Gore. Patiño's starts have become must-watch events at Parkview Field. The 6-foot, 190-pound hurler is far more polished than most Midwest League starters, getting ahead with a 95-97 mph fastball he can spot on the corners and putting hitters away with a devastating slider. He has pitched at least five no-hit innings in three of his last nine starts. As he carves through opposing lineups, Patiño routinely flashes a wide smile. He's one of the team's jokesters, quick to cheer on his teammates and seemingly always beaming. “When you feel good, when you are happy, I like to support my teammates because if a pitcher has a bad inning, when you're funny, you're supporting him,” Patiño said. Other organizations have taken notice of Patiño's performance. When the Padres inquired about Tampa Bay Rays starter Chris Archer before Tuesday's trade deadline, the Rays reportedly targeted two minor-league players: elite Double-A pitcher Chris Paddack and Patiño. The Padres' answer: we'll pass. San Diego is planning for the future with its cavernously deep farm system. Patiño wasn't supposed to be at the forefront of those plans, but after a half-season of dominance in Fort Wayne, he certainly is now.